Economic indicators were again mixed in February 2012. As expected, the Oregon Measure of Economic Activity rebounded to -0.34 from an upwardly revised -1.10 in February (“zero” for this measure indicates the average growth rate over the 1990-present period). The three-month moving average improved slightly to -0.53. Both the manufacturing and services sectors made net positive contributions the measure, while the construction and household sectors remained a drag. Low levels of building permits, still high unemployment, and low levels of consumer confidence were significantly weak components. Note that current nonfarm payroll data is likely underestimating job growth in Oregon, suggesting that the Oregon Measure of Economic Activity will be revised upward. Considering the likely revision, Oregon is growing near its average rate of the last two decades. The University of Oregon Index of Economic Indicators™ was flat in March. Underlying components were mixed. Initial unemployment claims edged up, and employment services payrolls, largely temporary workers, edged down. 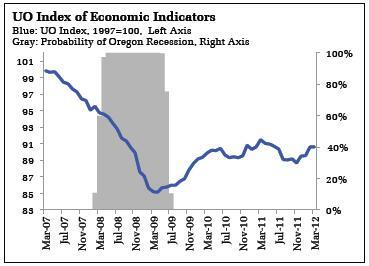 Compared to six months ago, the UO Index rose 3.6 percent (annualized), a rate that suggests continued growth in Oregon in 2012. Similarly, the flow of national data is generally consistent with steady growth, although the pace remains below that necessary to quickly return economic activity to its pre-recession trend.